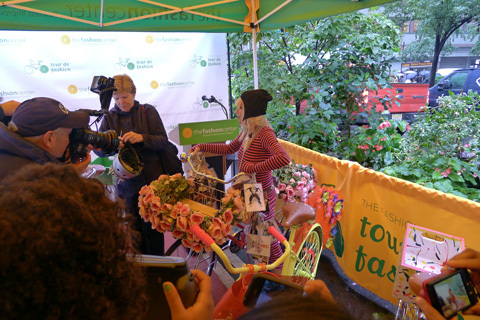 Barbara Randall, Fashion Center BID President, helps Betsey Johnson with her bike helmet. 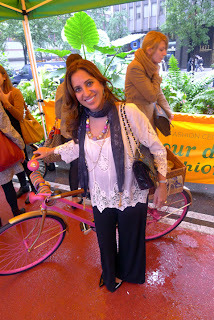 Yesterday I stopped by The Fashion Center's tour de fashion press conference and enjoyed coffee while perusing fabulous designers and their bikes. 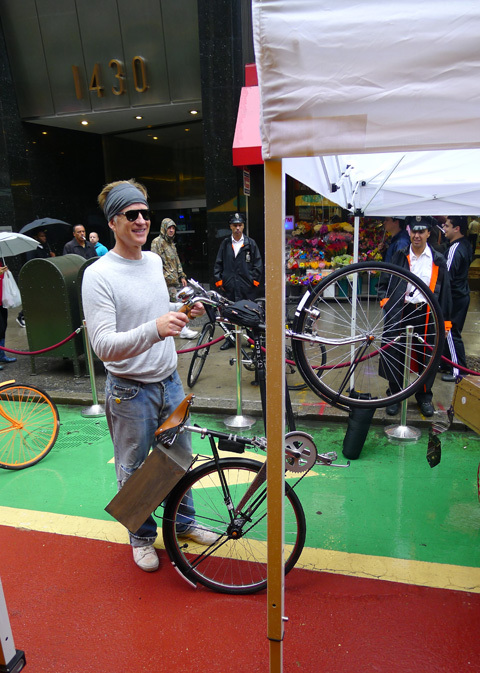 Bike enthusiast Matthew Modine (below right) was there, picking up bikes and posing in a headband. Very chic. 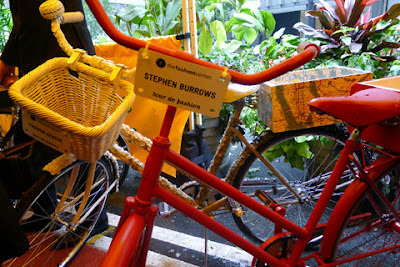 Betsey Johnson made an appearance and gamely posed with her bike in the drizzling rain for photographers. And the lovely and talented jewelry and accessories designer Amrita Singh (below) posed next to her bike, that was decorated to suit a Maharaja or Maharani. Even better, her staff will be giving away goodie bags filled with jewelry the entire week of September 8-15 to everyone who rides her bicycle. That's seriously in the spirit of anything for fashion! 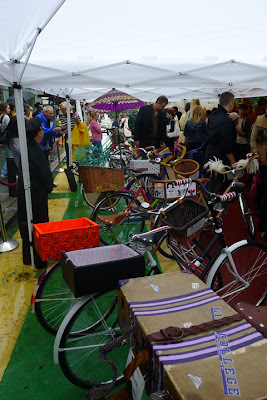 Where to pick up the bikes? Click here for all the info you need on the bikes, which riders can borrow for 60 minutes, plenty of time to ride between the Fashion District and Meatpacking, where many Fashion Week shows take place. I think in 60 minutes one could ride up to Lincoln Center, catch a show, then pedal back to Broadway and 40th Street. These bikes, available just during Fashion Week, will then be auctioned off to benefit the Council of Fashion Designers of America’s Fashion Incubator program. Click here to start the bidding!